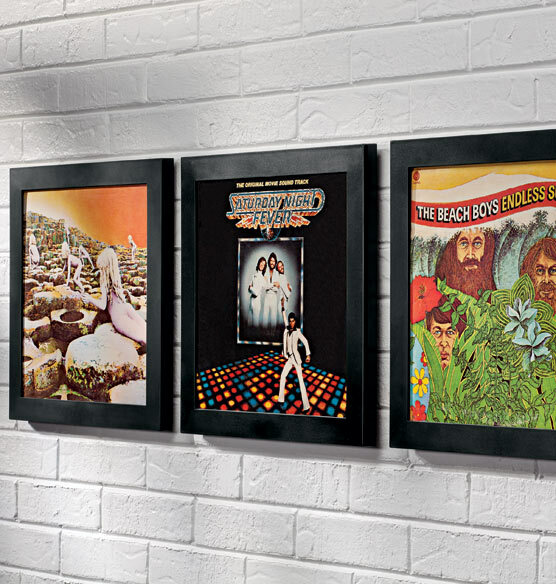 Your albums are part of your history, why not display them as art? 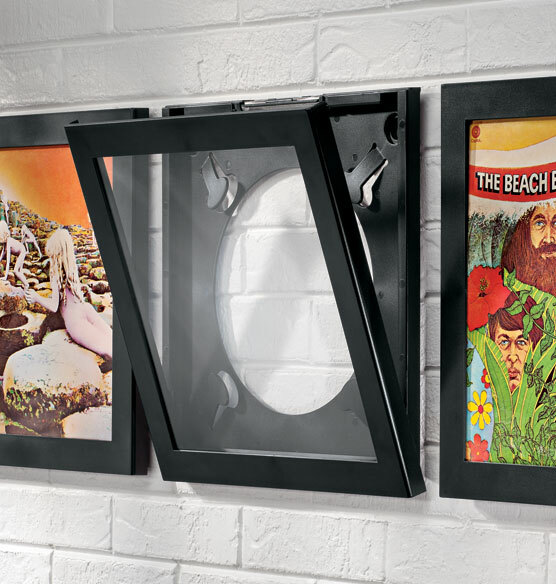 Hang albums on your wall for storage with this vinyl record display frame, then easily remove them for play thanks to the unique flip-down mechanism. Great gift idea! Each polyresin vinyl record frame holds at least 3 albums. Includes wall protectors. Vinyl record display measures 12 1/2" x 12 1/2". Exposure does quality items for conservation of items. Also liked the wider frame. Perfect for my needs with my large vinyl record collection. after searching many different websites, this item seemed to be the best value. great looking product. bought them for a client who wanted to display albums and be able to change them out when he wanted, as well as have the ability to take out the vinyl. This served the purpose perfectly. My husband has an autographed Aerosmith album and I thought this would be a great way to get that album out of the garage! Because it's the coolest thing ever! I ordered one of these and am now ordering a second one for my daughter. At my husband's memorial service she had guests sign vintage Johnny Cash albums - these frames make a perfect display, allowing her to rotate the album in view. Quite a unique item. I like the idea of being able to easily access the LP after framing. Nice display & access to album. Have some old Elvis Presley album covers I want to display. My son-in-law is a big music fan with lots of vinyl albums. I think he'll love this and want more! I hope to have a special vinyl record to display in the frame. Is it a glass or plexi front? BEST ANSWER: Thank you for your question. The front is open, there is no clear cover. We hope this information will be of help to you. How wide is the black piece on the front of the frame? Also I"m confused, is the clear front section of the frame covered with glass, plexiglass or nothing? BEST ANSWER: Thank you for your question. The frame is 15/16”. There is no cover in front, it is an open. We hope this information will be of help to you. is this frame made in the US? BEST ANSWER: Thank you for your question. No, it is made in China. We hope this information will be of help to you. Does this frame cause any damage to the album covers? Is it a tight fit to put an album in this frame? BEST ANSWER: Thank you for your question. 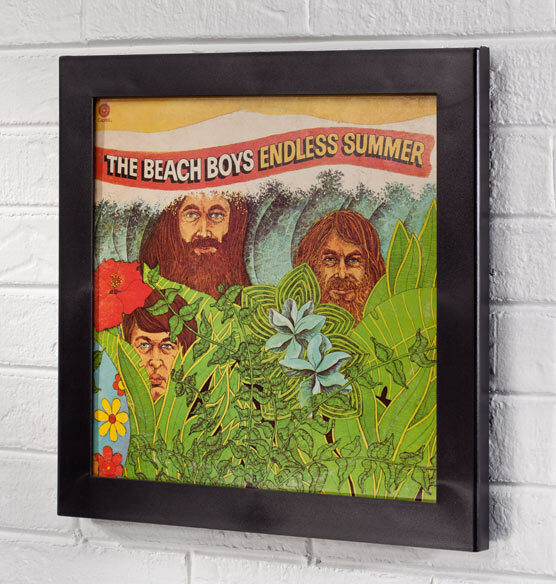 No, this item will not damage your album covers, it measures 12 1/2" x 12 1/2. We suggest you measure your albums to make sure they are not too large. We hope this information will be of help to you. Is the front of the frame glass or plastic? BEST ANSWER: Thank you for your question. The front of this item is glass. We hope this information will be of help to you. Could you display just the LP? Like a picture disc with no sleeve?